Artist Laurie McCall makes dreamy Cornish surf-scapes featuring surfing beaches at their absolute best. Artist Laurie McCall makes dreamy and surreal seascapes featuring line ups around Cornwall. “I moved to Cornwall when I was 10. My dad took me bodyboarding at Chapel Porth one summer and I was instantly hooked on the ocean, I couldn’t get enough of it and I still get the same buzz from it today. I studied graphic design at Falmouth University whilst practicing art in my spare time. After uni I pursued a career in design. After a few years of struggling to find the job satisfaction I was after I decided to try something new. I wanted to combine my skills in design and art with my love for surfing and the Cornish coast. After a lot of time and perseverance I developed a unique style of art and it began to prove popular with the public. My style is a combination of clean lines and vibrant colour with subtle texture. Influenced by my design background and my love for working with collage. 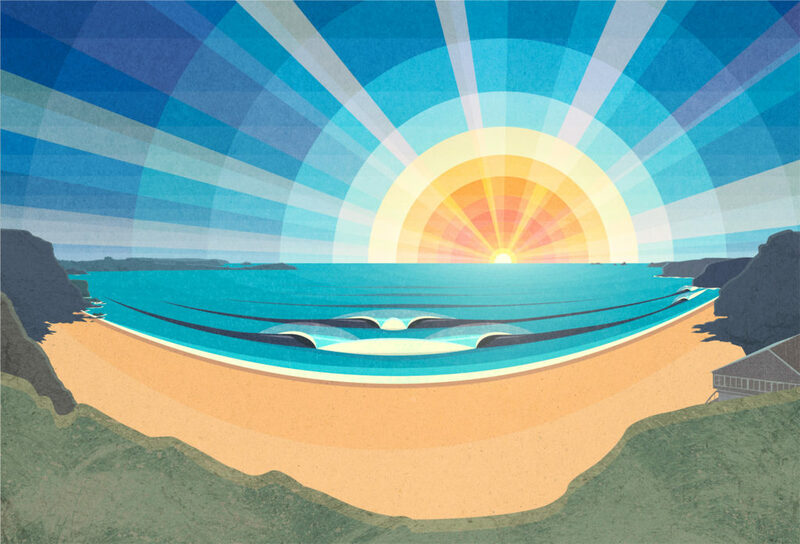 In my ‘Surfscape’ works I illustrate Cornish beaches with dreamlike, once in a lifetime surfing conditions. The kind of conditions we’d all like to rock up to our local beaches and see. I try not get too hung up on detail in the images and keep things bold and simple, letting the viewers imagination do the work, perhaps taking them back to one of those all-time sessions ‘when the banks were good’! You can buy prints of Laurie’s images on his website here. And follow him on instagram here and facebook here.